Physical activities get your students out of their chairs, learning better. Minecraft, which is a game-based effort to engage and keep students focused on learning, taps into student enthusiasm about gaming. Even more important, it models cooperative learning that mirrors teams in the workplace. The skills they develop are the “glue that keep people working together” (source: Getting to Know Minecraft: Education Edition slideshow). Think of Minecraft as a giant, blank canvas, a genesis of divergent learning opportunities students can take advantage of. Minecraft: Education Edition (M:EE) brings a plethora of built-in opportunities ripe for written/video reflections on learning. Also, opportunities for flipped learning about relevant topics are embedded in project-based learning. Step #1: Get your hardware and software licenses in order.Before you can get M:EE going in your classroom, you will need to ensure that your computers have Windows 10 or OS X “El Capitan.” Also, each machine will need an external mouse and every student will need an Office 365 account. These accounts are available through your school district’s Office 365 setup or via a free account. Step #2: Install Minecraft: Education Edition on Windows 10 computers.To get M:EE ready to go on your Windows 10 or Mac OS X “El Capitan” computers, you will need to go to the M:EE web site. You will need your Office 365 account to get access to the software. Check out the M:EE Frequently Asked Questions (FAQs) to get started. View this short installation guide with screenshots. Video #1 – Learn to Play Minecraft: Get ready to jump into a Minecraft world. It will help you learn the controls you’ll need to play. Learn to move around, swim, climb, jump, and place and destroy blocks. Video #2 – First Weeks of Learning: This is the introductory module for the Minecraft in Your Classroom course. Some teachers may wonder whether they should take the time to incorporate game-based learning into their already packed curriculum. In this module, you will learn (1) what type of learning environments result in the greatest retention by students and (2) how Minecraft Education Edition not only supports such learning environments, but creates a safe, risk-free learning space for students. Video #3 – Building Blocks of Literacy: This panel explores how and why Minecraft is being used to encourage literacy through play. From artistic collaborations between literature and gaming to stimulating learning through role play and stories, to nurturing new voices and young storytellers, you will take a closer look at the ways Minecraft is inspiring a new generation of readers and writers. Step #4: Learn key terms and tools in Minecraft: Education Edition. M:EE brings a wealth of specific classroom tools. These are intended to make the game less about surviving zombies, creepers, and griefing (e.g. destroying) and more about working together to externalize learning. Check this glossary available online. Step #5: Plan your project-based lesson.There is a rich collection of M:EE lessons you can adapt for your own use! We will explore these in more detail in a future blog entry. 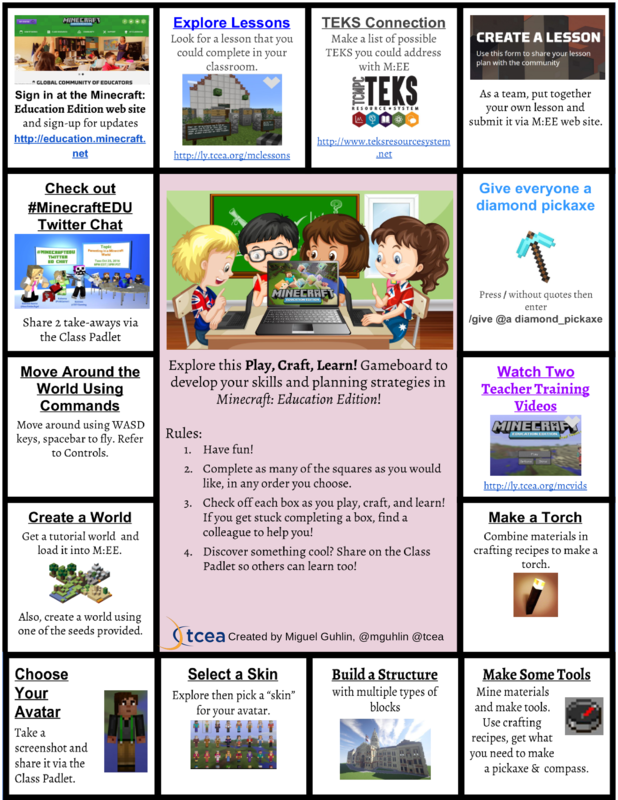 For now, take a look at some of the ideas displayed in this TCEA TechNotes blog entry Amplifying Creativity: Minecraft Fairy Tales. Did you know? 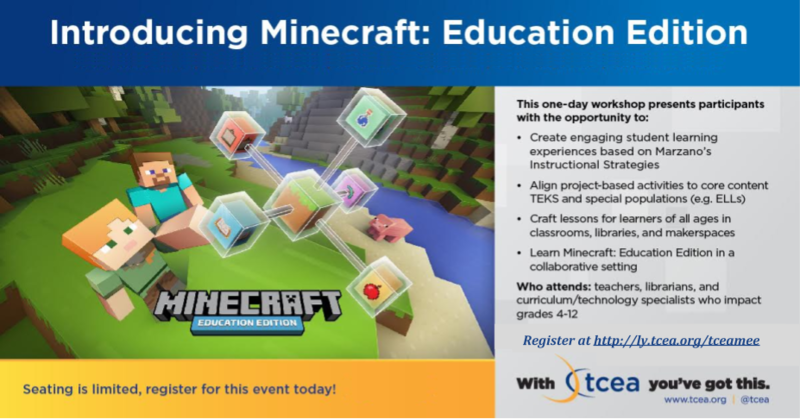 TCEA is offering Introduction to Minecraft workshops throughout Texas. The first is January 23, 2017 in Pittsburg (Area 8). The second is February 27 in Edinburg (Area 1), and there is another on March 31st in Victoria (Area 3). Online course offerings will also soon be available! Sign up now to learn with a Minecraft Certified Trainer. Technology can facilitate real-life learning through the presentation of ill-structured problems. Minecraft: Education Edition enables learners to create external thinking models as they work to solve those problems. This short guide should start you on a journey of discovery.